District Council 53, located at 1591 Washington St East, Charleston, is a Labor Organization representing over 1,800 members in the construction industry, such as, Painters, Drywall Finishers, Glaziers, Hydroblasters/Vacuum Technicians and Sign and Display workers. Take a moment to check out the latest News and Events, meet our Leadership, and learn more about the Industries we represent. It is now possible to have your dues paid automatically, thereby ensuring your dues are always up-to-date. This service is totally free to our members! Just click on the links below to find out more. You can still pay your dues at the Charleston Hall located at 1591 Washington St E, Charleston, WV 25311. You can also mail your dues to our address listed. NOTE: WE HAVE MOVED! DO NOT USE OUR OLD MAILING ADDRESS. ALL CORRESPONDANCE SHOULD BE MAILED TO OUR NEW ADDRESS. THANK YOU! Because of your phone calls and emails, we were able to defeat HB 2441. 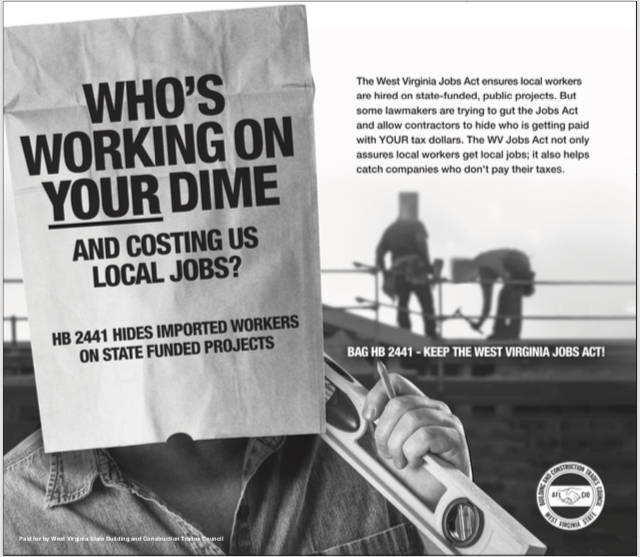 HB 2441 would have gutted the WV Jobs Act which ensures state-funded projects have a minimum of 75% local workers on their jobsite. Passage of this bill would have made it impossible to catch contractors who cheat by stealing jobs from local workers. Thanks again for taking a stand for WV working families! Be sure to check out the “News Items” tab for additional information about the 2019 WV Legislative Session. DC 53 members joined their union brothers and sisters on April 14 for the Annual IUPAT Day of Action. 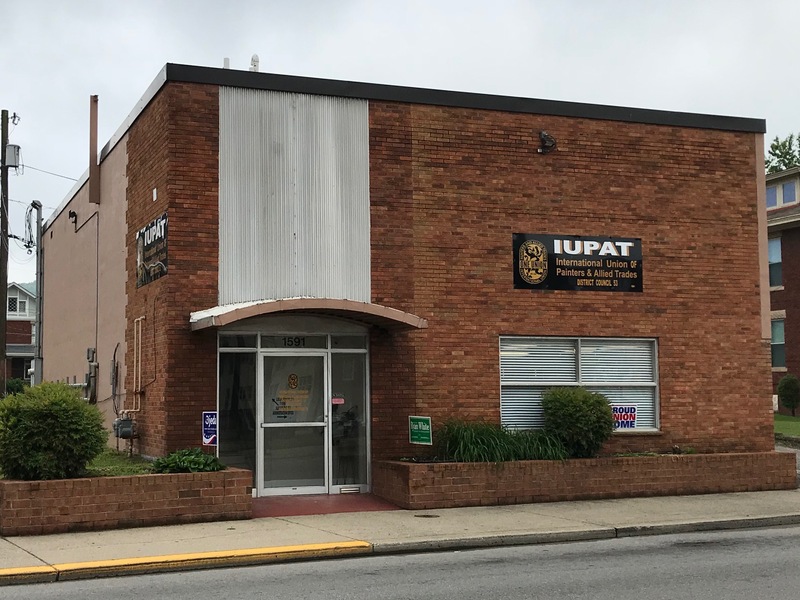 IUPAT members from throughout the United States and Canada joined together to volunteer their time and talents for local projects. 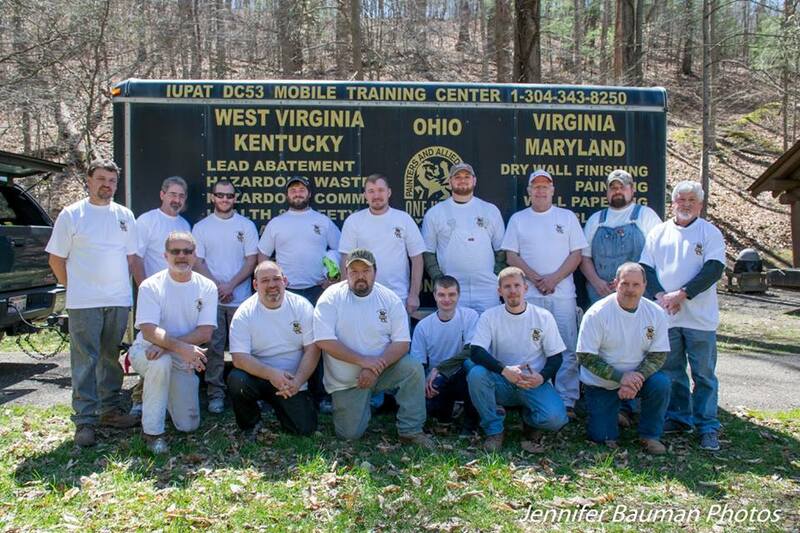 DC 53 member volunteers stained and painted shelters and bath house at Johnson Hollow in the Kanawha State Forest. Member volunteers: Front Row (left to right): Jerry Scarbro, Brian Stanley, David Barker, Colton Meinecke, Harold Keller, Steve Hicks Back Row: Joe Carpenter, Ben Blake, Jared Scarbro, Kent Scarbro, Mike Lively, Zac Casto, David Morris, DJ Eddy, Daniel Poling.